CAIRO, Jul 26 2014 (IPS) - Less than four percent of Egypt’s land mass is suitable for agriculture, and most of it confined to the densely populated Nile River Valley and Delta. With the nation’s population of 85 million expected to double by 2050, government officials are grappling with ways of ensuring food security and raising nutritional standards. One possibility under study is to adopt integrated aquaculture, a holistic approach to food production in which the wastes of one commercially cultured species are recycled as food or fertiliser for another. Projects typically co-culture several aquatic species, but the synergistic approach also encourages the broader integration of fish production, livestock rearing and agriculture. “An integrated approach would seem the logical next step for Egypt’s aquaculture industry in that it can significantly reduce water requirements while increasing fish farmers’ revenues,” Beveridge told IPS. Egypt’s aquaculture sector has witnessed explosive growth in recent decades. Annual production of farmed fish climbed from 50,000 tonnes in the late 1990s to over one million tonnes last year – exceeding the combined output of all other Middle East and African nations. But fish farming as it is predominantly practised in Egypt – by simply digging a pit and filling it with water and fish – has a major drawback. A decades-old government decree requires that drinking water and crop irrigation be given first call on Nile water, leaving aquaculture projects to operate in downstream filth, contaminating fish and limiting productivity. 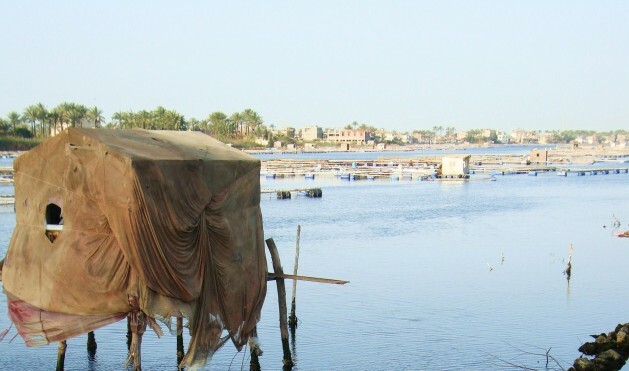 “Over 90 percent of the aquaculture in Egypt is based on agricultural drainage water, with plenty of pesticides, sewage and industrial effluents,” says Sherif Sadek, general manager of the Cairo-based Aquaculture Consultant Office. Integrated aquaculture reverses the water-use paradigm, with tangible benefits to both fish farms and farmers’ crops. While the practice is still in its infancy in Egypt, several projects have demonstrated its commercial viability. At the El Keram farm in the desert northwest of Cairo, farmers use pumped water for tilapia culture, recycling the water into ponds where catfish are raised. The drainage from the catfish ponds, rich in organic nutrients, is then used to irrigate and fertilise clover fields. Sheep and goats that graze on these fields generate manure that is used to produce biogas to heat the tanks where fish fry are raised, or to warm the fish ponds in the winter. “The project has demonstrated how farmers who switched to aquaculture after salinity rendered their fields infertile can increase their productivity and profits using the same volume of water,” says Sadek. Other integrated projects on reclaimed desert land culture marine aquatic species such as sea bass and sea bream, directing the downstream wastewater to pools of red tilapia, a table fish able to tolerate high salinity. According to Sadek, the brine from these ponds can be used to grow salicornia, a halophyte in demand as a biofuel input, livestock fodder and as a gourmet salad ingredient. “Salicornia can be irrigated with extremely salty water and produces seeds and oil, as well as fodder for camels and sheep,” says Sadek. According to development experts, integrated aquaculture delivers greater efficiencies, requiring up to 70 percent less water than comparable non-integrated production systems. It is also a cost-effective method of disposing of wastes and saves resource-poor farmers from having to purchase fertilisers. Beveridge says small-scale Egyptian aquaculture ventures unable to afford the complex closed-loop system employed at El Keram could still benefit from integrated practices that would allow them to harvest commercial food products year-round. Pilot studies have shown that fish farmers are able to capitalise on the nutrients locked up in the mud at the bottom of their earthen fish ponds. “The idea is that you drain down your ponds in November, harvest your fish, then plant a crop of wheat in your pond bottom that you would harvest in March before flooding the stubble area with water and reintroducing young fish,” Beveridge explains. If the given is that population will double, there isn’t likely to be enough of anything. And then it won’t double, in painful ways that don’t need to be described here. How about rights for women and birth control? Brilliant, exactly the type of solutions the world needs to counteract the destruction and waste of linear agriculture.